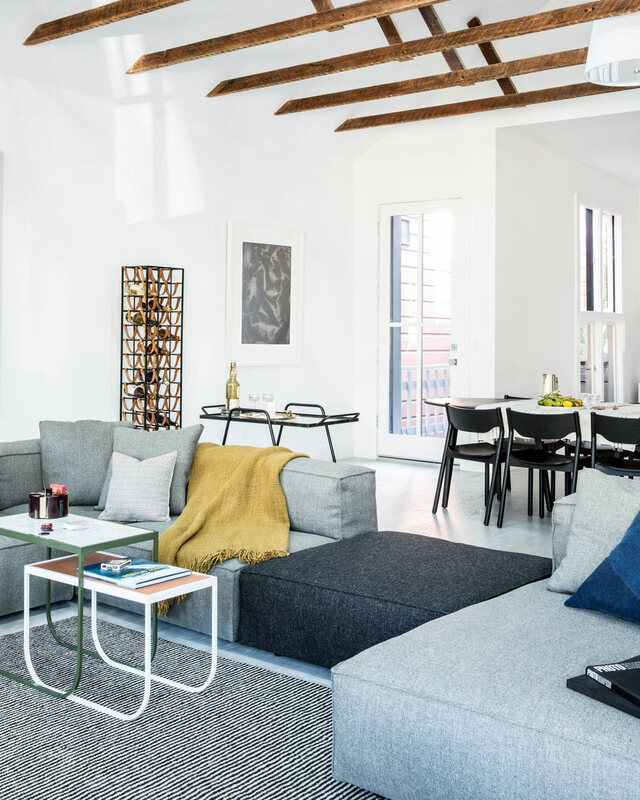 A Scandinavian-Inspired Apartment in NY - The Hieno! Designer and art curator Lauren Geremia, of Geremia Design, designed this apartment in the Mission District of San Francisco for a bachelor. With a Scandinavian feel, the relaxed and bright interior works well for the resident’s lifestyle and desire to entertain. The white walls offer the perfect canvas for a curated art collection by artists, like Noemie Goudal, Tauba Auerbach, and Josef Hoflehner, where each piece works as a contrast to the muted color palette. A modular sectional was brought in making different arrangements a possibility when guests are over. The dining chairs stack and the vintage bar cart is mobile when need be. The vaulted ceilings showcase original exposed wood beams that bring character to the space, along with using a mixture of vintage and modern furniture pieces.